Enough size/capacity for septic tanks is critical for making sure that enough primary treatment happens before effluent enters drain field lines, or ahead of further treatment processes. That information will in turn dictate how much space is needed for the tank(s), and what type(s) of material of construction for the tank would be feasible to consider. The size of septic tank needed depends on the amount of wastewater flow coming from the home or business(es) served. Because flows tend to change on a daily, weekly or seasonal basis, and because it’s important to protect the system from problems year-round, it’s important to use peak seasonal or weekly flows for sizing the tanks. Many systems fail because septic tanks are undersized. In cases where there are accurate daily, weekly and seasonal water usage records for households and businesses, that information can be used for sizing septic tanks. In many cases, wastewater flow from residences and businesses needs to be estimated, based on things like square footage, number of bedrooms, and occupancy/usage. In the U.S., many studies have been done on water usage rates for both residences and buildings. The results of those studies offer some basic sizing criteria that can be helpful for guiding projects. Below is some information that can be used for general guidance for estimating wastewater flows and sizing septic tanks. It rarely pays to “skimp” on septic tank sizing. The incremental cost per gallon of tank capacity spent to make sure that enough primary treatment happens is well worth the investment. That investment is usually quite small compared with the cost of either clearing out and repairing or replacing dispersal field lines, or servicing, repairing or replacing treatment units/processes that may follow septic tanks. Given the costs of having sludge/septage pumped from septic tanks, it’s important to keep that need to a minimum. At a cost of somewhere around $1 per gallon for concrete tanks, it’s definitely better to be safe than to be sorry later. Some property owners in the VI currently are using small packaged secondary/advanced treatment units for their residential onsite wastewater systems, along with some commercial properties. Most of those small packaged treatment units consist of a tank with some means of aerating the liquid in the tank. That category of treatment process is called the “activated sludge” wastewater treatment process, and there are several types of activated sludge processes. Those include extended aeration, sequencing batch reactors, and membrane bioreactors. The topic of secondary/advanced treatment systems will be covered in some detail in later segments posted to the website. However, there are a few important points that relate to the importance of septic tanks and their sizing. 2) The bacteria providing secondary treatment are aerobic, so enough air/oxygen must be pumped or otherwise entrained into the tank of wastewater to maintain aerobic conditions (some other secondary treatment processes are naturally aerobic, and so don’t require constant aeration and electric power usage). Tanks of wastewater can quickly become “septic” if left without aeration for significant periods of time. 3) “Bacteria don’t have teeth.” That is a quote from a microbiologist friend and colleague. The significance of that comment for secondary and advanced wastewater treatment systems is this: Bacteria responsible for providing secondary/advanced treatment can only process dissolved pollutants. They cannot break down solids (unlike us humans who have teeth, and can chew up and swallow solids). Therefore, the suspended solids in the wastewater need to be settled out before the stage in the treatment processes where secondary treatment is to occur, and where those bacteria are relied upon to provide treatment. In efforts to make manufactured treatment units more affordable and appealing for use, some manufacturers downplay the need for adequate primary treatment. However, the following adage holds true on that front: “There’s no free lunch.”There’s just no getting around the laws of physics and realities of microbiology here. There are several well-proven secondary/advanced treatment approaches other than activated sludge processes that may be used for de-centralized wastewater systems. Selecting the most cost-effective and sustainable one requires considering things like energy usage, maintenance and servicing needs, frequency of sludge/septage pumping, reliability of treatment performance, and useful service life time. Secondary and advanced methods of treatment will be discussed in detail later on this website. 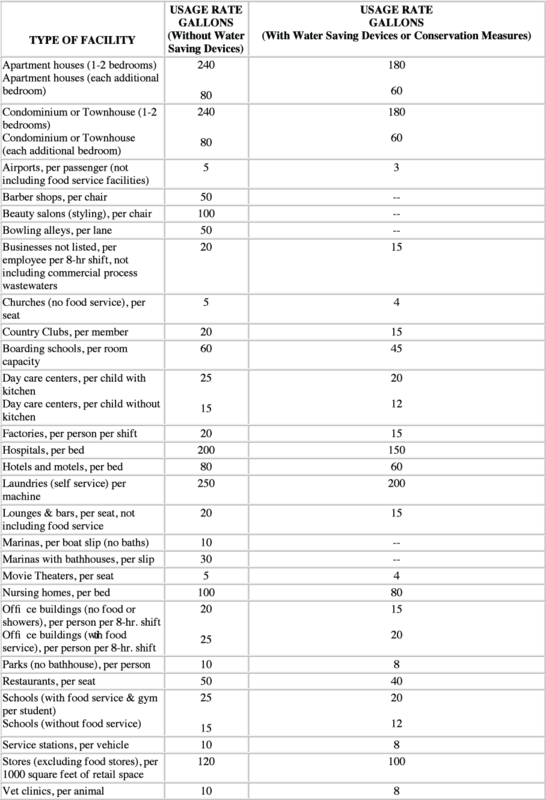 Table 1 below can be used for estimating flows from residences, and Table 2 can be used for commercial facilities. 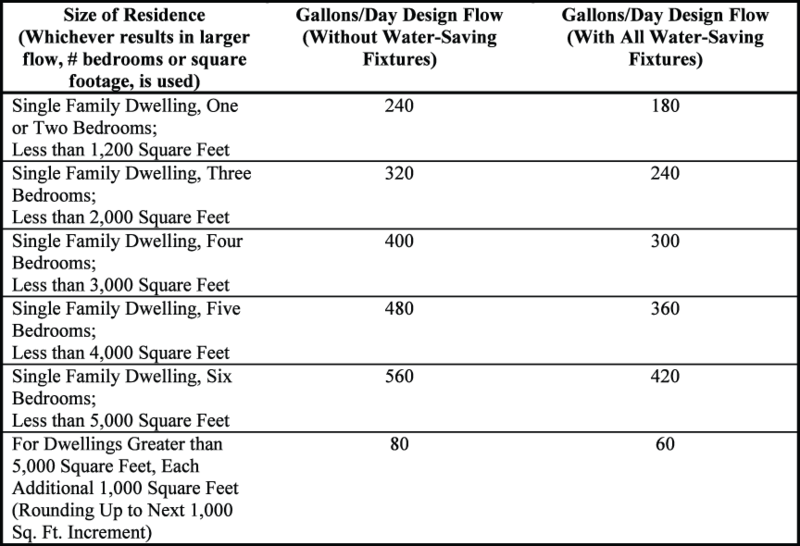 The rightmost column in Tables 1 and 2 gives daily design flows with consideration to water conservation and/or use of water saving fixtures. Table 3 below can be used to size septic tanks, based on daily flows from Table1 or Table 2. NOTE: At such time as the VI may adopt rules with established criteria and requirements for determining wastewater flows from residences and businesses, and tank sizing criteria, those criteria should be used. Table 1: Residential Daily Flow Criteria. From: Planning and Installing Sustainable Onsite Wastewater Systems, S.M. Parten, McGraw-Hill, 2009. 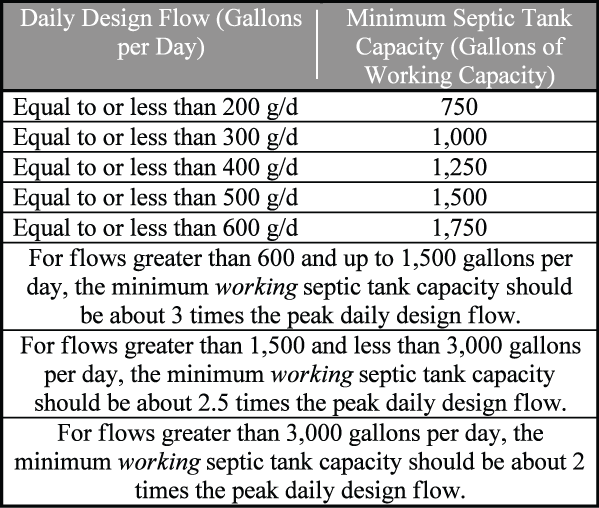 Note use of the term “working” septic tank capacity in Table 3. It’s important to remember that the working capacity of a septic tank is only that portion taken up by the “clear zone” in a septic tank (refer to Figure 1 from the first segment of this series on “Septic Tanks and Conventional Onsite Wastewater Treatment”). When septic tanks are newly placed into service, or have just been pumped (before any sludge or scum have built up and occupy a portion of the tank’s volume), the working capacity is the full depth of the liquid in the tank. Later, after sludge and scum build up, the working capacity is the liquid depth minus the volume taken up by accumulated sludge at the bottom of the tank. As sludge continues to build up, increasingly less “working capacity” is available for settling out solids in the tank. The “head space” also makes up a significant portion of the tank’s total interior volume. That’s usually at least about 9-12 inches between the underside of the tank lid (underside of the top surface of the tank) and the scum or liquid level. It’s therefore important to remember when selecting tanks that enough working capacity is provided. It’s also very important to periodically check the sludge level in septic tanks to determine if pumping is needed, and prevent solids from washing into either dispersal field lines or into secondary/advanced treatment processes.